ON TOUR: American business jet get together. NBAA – the biggest biz av show meets in Orlando. 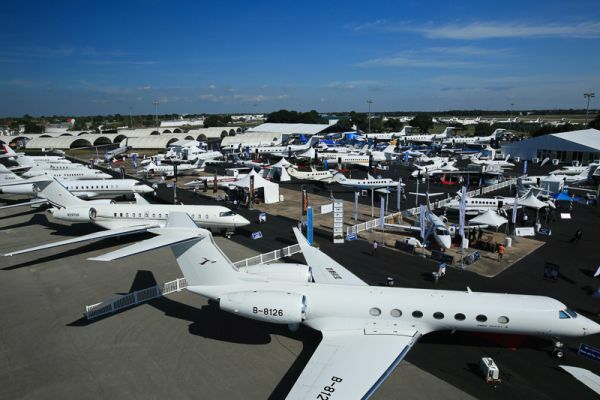 Orlando, Florida and Las Vegas have become the only US cities with convention centres big enough to host NBAA, the international business aviation fraternity’s biggest annual gathering. Both are of course highly popular year round destinations (for very different reasons). Alison Chambers and Jane Stanbury have been off to Florida. This year we were back in Orlando, and with show dates just five days shy of half term, many international delegates chose to fly via more business centric US cities and connect - just so they didn’t have to spend nine hours in a confined cabin with excitable children. Or they brought their families along and made an extended holiday of it. Some went to Universal Studios and felt guilty they didn’t have their children with them! 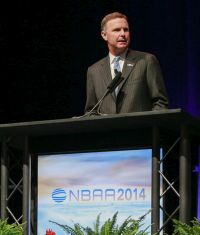 A total of 95 countries participated at NBAA 2014 and show organisers registered over 26,000 attendees. 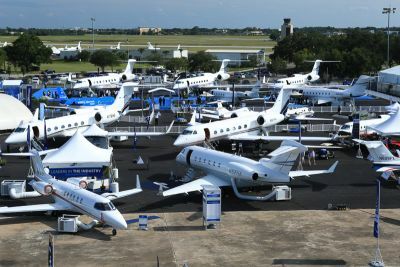 Over 1,100 exhibitors displayed their products and services at the Orange County Convention Centre, complemented by 100 business aircraft available for viewing at Orlando Executive Airport. The sector never disappoints with new aircraft models to see or to hear about. Gulfstream Aircraft didn’t just announce a clean sheet aircraft – it rolled it out – in Savannah, Georgia, a week ahead of the show. A video of the new model was replayed at a standing-room only press conference. The new G600 and G500, with 6,000 nm and 5,000 nm range, respectively, have been secretly in works by the OEM since 2009, both designed to offer greater speed (Mach 0.85), range, cabin volume and flightdeck technology. The new models also see a switch of powerplant supplier from Rolls-Royce to Pratt & Whitney Canada PW800 engines. Pricing is set at US$43.5m for the G500 and $54.5m for the G600. The aircraft has quickly found favour with Qatar Airlines, which signed an MoU for up to 20 of the aircraft for its bizjet company, Qatar Executive, up until now a firm Bombardier customer. Bombardier was also showing off a new model, the Challenger 650 and announced NetJets, the premier fractional ownership/ jet card company as launch customer. Their order for 25, plus 50 options was disclosed two years ago – allocated to an undisclosed customer. Bombardier also brought to Orlando the new Learjet 85, its mostly composite and largest Learjet series to Orlando taking it out of its flight test programme. Embraer announced its Legacy 500 had won US FAA certification, just as the type commenced a mini tour in Europe stopping off at Oxford Airport, well placed for London, where Embraer products are regularly flying in and out. There were three highlights at the show. The first was the resounding rejuvenation of interest in the decade-long Aerion Supersonic Jet programme, hard on the heels of Airbus Group (Defense and Space Division) jumping in as an industrial partner. Allan McArtor, Chairman of Airbus Inc., speaking at a champagne reception photocall to toast the new partnership with Aerion founder Robert Bass, insisted that Airbus was backing the project “all the way to the finish line.” The company would also be looking to assist in the final design, he noted. A survey earlier this year showed a market for more than 600 supersonic business jets over 20 years. On the other end of the scale, highlighted at NBAA, was the ongoing success (in a new role) of a 50-year old venerable aircraft, the Beechcraft King Air. New York based Wheels Up Chairman Kenny Dichter highlighted his private aircraft membership model (centred around the King Air 350i, now has 750 members and is on track to have 1,000 by year end. Over the past 12 months a total of 37 aircraft (including eight Cessna Citation Excel business jets) have come on line and 156 pilots trained up and recruited by operating partner Gama Charters Inc. These aircraft are now performing up to 40 flights a day. “What we have achieved inside a year is akin to starting a commuter airline,” suggested Gama Aviation CEO Marwan Khalek, whose US division is expanding into Texas to provide line maintenance support as Wheels Up moves into a Houston and Dallas from November. Kenny Dichter applauded Gama’s pilots for supporting his company, but also paid tribute to Bill Boisture, former Beechcraft CEO, who during NBAA announced his involvement with a brand new aircraft finance company, Global Jet Capital, alongside former Beechcraft executive Shawn Vick and David Rowe and backed by GSO Capital Partners, The Carlyle Group and AE Industrial Partners. The new company will specialize in financing larger business aircraft - US$15m and up. “Were it not for him I would not be on this stage today,” Dichter said, reminding media that Wheels Up had placed its order for 105 King Air 350is when Beechcraft was still in Chapter 11. “We had great belief in that aircraft. I compare it with the Land Rover – most happy in the desert, but present and commonplace on the roads in any city around the world. Thirdly, was the number of international deals being announced in the exhibition halls. For example, Canada’s Flying Colours Corp, the bizjet completions, refurbishment and maintenance company announced a multi-million dollar deal with Sparkle Roll of China. Sparkle Roll is the lead brand for luxury in the country with a Beijing showroom displaying a full mock up of an Embraer Legacy 500. The new joint venture sees Flying Colours supporting the refurbishment of eight CRJ aircraft into VVIP configuration which will be sold by Sparkle Roll alongside its watches, yachting and fine jewellery offerings. It is anticipated that the joint venture will broaden out into a wider range of aircraft in the future and will enable skill sharing of the Canadian expert with their Chinese partners. Chicago-located JSSI, the world’s largest independent provider of hourly cost maintenance programmes for aircraft engines and airframes signed an agreement with the African Business Aviation Association which will see members of the Association receive major financial benefits when signing up with JSSI for aircraft purchases. UK headquartered Air BP, the aviation fuel company, announced the ratification of an LOI with trip planning service RocketRoute in a collaboration that will provide customers with a more efficient approach to flight preparation.